Abraham Lincoln was the 16th President of the United States who served in office from March 4, 1861 to April 15, 1865. What was the life of Abraham Lincoln like? The short biography of President Abraham Lincoln covers important information and facts about his early life, his family, career and the famous events and achievements of his political life. 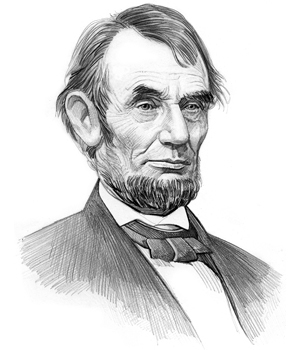 Our short biography of Abraham Lincoln provides an interesting and easy way to learn about the life of the President. The following important facts provide a fast overview of important facts about President Abraham Lincoln. Facts and Info: Abraham Lincoln was the 16th president of America who led the Union into the American Civil war (1861-1865) to preserve the nation and end slavery. He was assassinated five days after the Confederate armies surrendered. For additional info refer to 20 Facts about Abraham Lincoln. Facts and Info: Abraham Lincoln was largely self-educated and taught himself law. His career included the roles of Lawyer, Politician and Statesman. He became the 16th president of America in 1861 and served for 4 years until 1865. Facts and Info: Abraham Lincoln married Mary Todd Lincoln on November 4, 1842. They had 4 children whose names were Robert Todd, Edward Baker, William Wallace and Thomas whose nickname was “Tad”. Facts and Info: Abraham Lincoln belonged to the Republican Political Party. He was 52 years old when he was inaugurated as the 16th president. Hannibal Hamlin Andrew Johnson stood as the Vice president. For additional facts refer to his Presidential Cabinet members. Short Biography of Abraham Lincoln: What he was like! Facts and Info: Abraham Lincoln was an imposing figure standing at 6 feet 4 inches. He was born dirt-poor in a log cabin in Kentucky but became the man who raised armed forces of nearly 3 million Northern soldiers to face a Southern army of 2 million soldiers and the president of America. A 60-foot (18 meter) sculpture of his head is carved into Mount Rushmore as a monument to his many achievements. Facts and Info: The important events which occurred during his presidency included the Civil War which lasted from 1861 to 1865. Lincoln also issued the Emancipation Proclamation in January of 1863 and slavery was ended with the passage of the 13th amendment. Facts and Info: During his life Abraham Lincoln suffered from color blindness, Malaria, Depression and Smallpox. He survived these illnesses only to be murdered by the bullet of an assassin. Lincoln died on April 15, 1865, the morning after being shot at Ford's Theatre in Washington, D.C. by John Wilkes Booth who was an actor. He was buried at Oak Ridge Cemetery, Springfield, Illinois. The short biography of Abraham Lincoln provides a fast overview of the key facts and events about his life and the accomplishments of his presidential term in office. The following Abraham Lincoln video enables you to sit back and listen to the history of his personal and political life - a useful educational resource for kids, children and schools learning about the life of President Abraham Lincoln.